My mind knows I can’t do it. It’s an arduous trek. With poor stamina levels and a sorrowful state of health, I try to convince myself that it is perfectly okay if I don’t attempt the six hour treacherous journey. But of course there is a tempting option of horses or mules that can be taken up midway, till the cafeteria. And deep down inside, my pounding heart has something else to say. If I do it, I do it on foot or not do it at all. The battle ensues till the morning of the trek. The Tiger’s Nest or the Taktsang Trek is on every Bhutanese pilgrim’s must- do list. 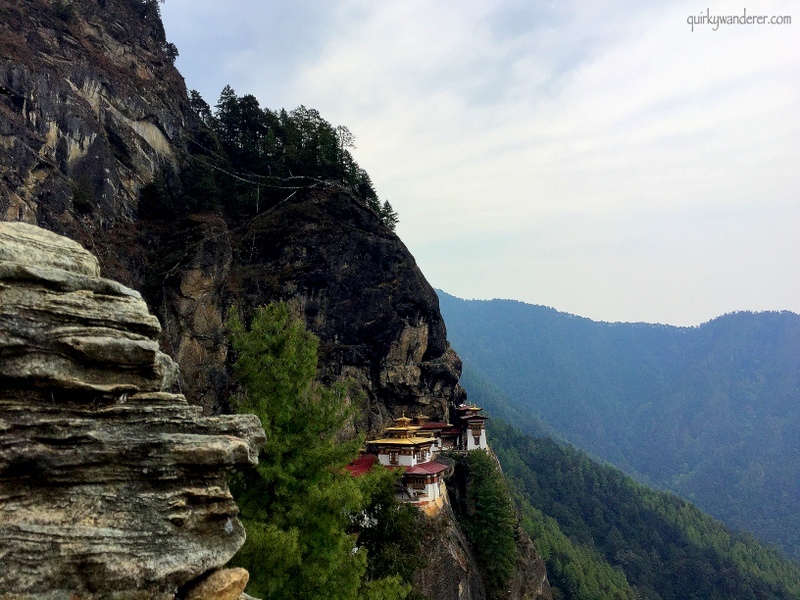 According to the legend, Guru Rimpoche (The Second Buddha) also known as Padmasambhava had flown on a tigeress to this small monastery, hanging off a cliff and meditated here. Padmasambhava is said to have brought Buddhism to this Himalayan kingdom in the 7th century. I start walking. Within 10 minutes I am panting, gasping for breath and stopping every now and then. I promptly ask it to shut up and trudge along. Slowly people start leaving, turning back to base. A few have sprinted ahead. Now I am all by myself. An empty, rustic path lies ahead of me. Surrounded by pretty rhododendrons and oak trees camouflaged with spanish moss. There is a song being played. I don’t know the source of this music, whether it is in my head or emerging from somewhere in the trees. But it is soothing. I feel enveloped in a peaceful calm. The air is energetic, full of positive vibes, like a burst of vibrant laughter. I close my eyes and breathe. At every step I feel someone is pulling my hand and urging me not to stop. It is an irresistible pull, coaxing with conviction. The path is steep and not in the least smooth. I breathe in and out, matching my breath with each step. It is the best meditation I ever did. I am now fully aware of each breath I take. Something I took so often granted, was being valued meticulously. Till now I have met and made friends with so many fellow climbers from Germany, England, Tibet, India and China. We meet for a few minutes, greet and continue our respective journeys. This only reiterates the fact that our life journeys are ours alone. The monastery keeps teasing by appearing and disappearing time and again between the forests, as if peeping through your journey, making sure you don’t quit. A grinning local asks me if I am a Hindu. I give him an affirmative smile, to which he replies by asking if I am alone. Faith. Resounding faith. There is a brush with spirituality at every bend in this trek. Not just in the wonders of nature, but the soul enriching experience it provides. After 2 hours I reach the last leg of this breathless climb. The 700 terrifying steps. By now it is easy to be acclimatized to the altitude. There is a mad rush at the viewpoint as people take selfies and pictures of the Tiger’s nest, which seems at an arm’s distance. I stand in awe. Watching this beauty hanging off the cliff, suspended like a miracle amidst rocky hills and deep gorges. With the destination so close, there is a sudden adrenaline rush to reach, but at the same time, a mad desire to stop the moment and soak in it, slowly relishing this feat. The sight was breathtaking. A huge waterfall gushing down the mountains, clouds hanging over the monastery and a mystic silence even though there were scores of people around. Sprinting up the stairs, my heart breaks into a victory lap as I stand stunned at the entrance of the monastery, 10,000 feet from sea level. Overwhelmed I break into tears, because I have outdone myself. The tiny dissuading voice is now silent. The universe seems to echo my emotions as a down pour begins. The monastery has ten lakhangs (temples), the tiger’s cave, the stone where Guru meditated and a room where butter lamps are lit. Half an hour later, my knee crunching descent begins. At some points of time, my legs begin to wobble in pain. But I am not complaining. The satisfaction of doing it from scratch, all by myself overruled the pain and made it too minuscule a phenomena as compared to what I experienced. Our group guide asks me if I lit butter lamps in the monastery. I do not even remember if I had said a proper prayer. But then wasn’t the entire journey a conversation with Him? A 6 hour meditation with open eyes and truly an unforgettable spiritual experience. Cameras are not allowed inside the monastery. A heavy duty cam will only increase the weight of your backpack. Opt for a Go-Pro, a compact camera or any good phone camera. Whether you are spiritual or not, at least for the love of nature, maintain the sanctity of the place by avoiding to opt for a horse/mule. The mule track till the cafeteria reeks of dung, courtesy the many ‘tourists’ who opt for these. Carry a small bottle of water, a poncho (can rain anytime), energy bars, nuts and chocolates. There is also a cafeteria mid-way. “I am positive, energetic, enthusiastic” This is what Doreen chirped happily in our ears. It always helps to be positive. If you think you can do it, you certainly can. Avoid timing yourself with others. Everyone has their own pace, though the average time taken is usually 3 hours to climb up and lesser during the descent. Enjoy the mystic journey without tying yourself to a time limit. The Tiger’s nest trek base is 10 Kms from Paro, nestled in gorgeous pine forests. For those who do not wish to trek, there is a wonderful shopping arena right where the trek starts, where a variety of Bhutanese handicrafts are sold. Also the base is fantastic for birding: birders can easily sight yellow billed blue magpies, rufous sibia, white throated laughing thrush and so on. Lastly, a big thank you to Doreen for believing I could do it and all the tips and tricks! How to plan a perfect Rajasthan trip? Thanks Maniparna! 🙂 So glad you like them! Marvelous! I cannot make such a trek, and can enjoy it through your images and words. Thank you! Thanks Deepika! The waether is really uncertain here. It was clear in the morning and started pouring later. Would love to read about your trip! Excellent post. Inspiring me to be there soon! Wonderful pics as usual and I’m glad to see you too. Your words take me there. Glad you could make it up there all the way on your own steam, wish I will be able to do it someday soon too!!? Thanks Aadil! 🙂 I am sure you will do it whenever you get a chance. Thanks so much 💖 how are you doing? How is the challenge going? Have a great weekend! Awesome narration and photos ! Beautiful meditation and the photography is amazing. Congratulations! Amazing place. Thanks for the post and photos. Thank you Divya for this lovely post. I have climbed Taktsang ten times but I have never cried as I did reading your post. You are awesome ! Fantastic narration and pics .. Great work .. Spectacular! I was panting with you every step of the trek! A mighty feat of sheer determination and passion! Your narration was heart-warming and very vivid. Congrats girl, so proud of you! Thanks kala! 🙂 I am so glad you liked it! 🙂 hugs! So you did it!!! Well done girl! This is an inspiration for me. Several times we planned Bhutan… somehow never worked out. Lovely captures from your trek. I did it too and with Doreen. Like you I was alone since the ones who gave up returned and the others were far ahead. In fact I met them when I reached the top and they were returning after the visit to the temple. I was with you every inch of the way and the memories came rushing past. Glad to meet a fellow Dorian 🙂 thanks for reading Margaret! I was impressed with your narration and pictures. I want to visit Bhutan and Tiger’s Nest is on my itinerary but I wasn’t aware of the trek. I am also not so physically fit but reading you, I want to do this for sure. What a fabulous post! Such beautiful photos! It looks like a wonderful, serene place to be at. Well done on the hike! Thanks a lot. It is indeed very pretty and totally worth it! Divya, thanks for the beautiful pics and personal narrative. I was determined to reach and meditate there – thanks to Doreen, I did so physically three years ago. I revisited mentally just now thanks to you ! You just said it. So so true Anin. A part of you changes on journeys like these! 🙂 thanks so much for reading! Great Divya, your will and I CAN attitude is commendable. Excellent pics .. very well written and beautifully captured the whole trek in your post… Yes, Margaret, even I felt like I trekked along. Doreen rocks! and her group is always left with lifelong memores. I actually did a steep trek of around 6-7K steps in DL Bliss State Park in Lake Tahoe in California last month. I was fine, but Saru got a sever back-pain and had to take rest for a couple of days thereafter. Whoa! That seems daunting! Would love to read about it. Have you documented it? I mentioned about it briefly in my last post, but it would again come up when i write about Lake Tahoe. Thanks Divya for sharing your blog – the beautiful pictures and thoughts. Though I did not reach the peak of Tigers Nest like you, while reading your interesting meditative narrative I felt i “did it” mentally. Thanks again. On my wishlist! Both Bhutan and this trek! 🙂 Beautiful captures and a honest post on the difficulties of hiking. Thumbs up for doing it! Your words and your pics – they literally make me want to experience it all! Hope and wish can make it possible soon! Very poetic blog. I was there recently. But I decided not to climb (on foot or on a horse) and stopped at the base camp with about 7 kg weight (of my camera and lens) around my neck. But your blog walked me through path (sans the experience of the peace). Thanks. A moving journey, so glad you made it there. Sounds like a lovely spiritual journey to the top. Stunning pics as always :). Beautiful captures and wonderful narration!! Well, so much drama haa.. i’m proud of you that you could make that journey! The place looks so good. The pictures as usual are amazing. And finally you opted to attach a picture of yourself too in the post. I’m glad you did so! hey! Thanks 🙂 glad you like it! I know what it takes to walk this much as I have visited many times the jain pilgrimage “Shikhar ji” in Jharkhand, as it also have the same landscape as you had described. This is the most incredibly beautiful post! Your narrative took me to Bhutan, it felt like I was also trekking along with you…. Your photos are an icing on the cake. The Taktsang Trek is something I would love to do – congrats on your own journey! This is probably one of the most beautiful monasteries in the world, but what you don’t hear about when you see the iconic shot featured in a magazine or shared online is the experience of the trek. So thankyou for sharing and offering your tips at the end. So worthwhile not having opted for a donkey! This hike looks fantastic and the photos are beautiful. If I get the chance to do this, I would be there in a flash! I’m rather proud of you. And I loved how you had such an overwhelming experience. Apart from the sights, it sounds like a once in a lifetime experience. I can totally see, why this trek was so meditative. These pictures look stunning. I would love to visit Bhutan one day. You are lucky to have been there. What an epic trek in all senses. The landscapes along the way look enchanting to the core. I can understand the difficulties and physical discomfort that you had to endure. But after the pain is probably the sweet sensation of success and achievement both literally and figuratively. Loved reading your narrative and the photos are really spectacular. I am sure you had a whale of a time hiking to Tiger’s Nest, though at that time it would not have felt so. 🙂 I have yet to go to Bhutan. Not rushing is the key here. I am reminded of hike to Hemkunt Sahib from Ghangaria, a climb of 1200 metres over 6 KM . But in the end the sight of the lake wiped away all our tiredness. Looks like an adventure! But I can see from your photos that it’s totally worth it! Way to go! Rhododendrons, oak trees, peaceful calm, soothing breeze and beautiful monasteries. Bhutan is certainly a mystical land. Thanks for sharing.